"Lower back problems are experienced by almost everyone at some time in their adult lives. Back problems rank high among the reasons for physician office visits and are costly in terms of medical treatment, time lost from work, and nonmonetary costs such as diminished ability to perform or enjoy usual activities. 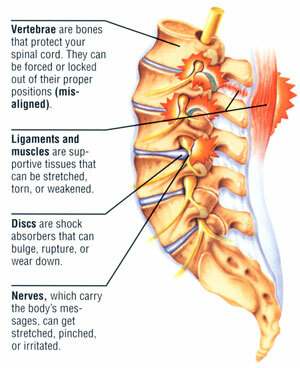 For persons under age 45, low back problems are the most frequent cause of disability." Bigos, S, et al. Acute Low Back Problems in Adults Agency for Health Care Policy and Research, Clinical Practice Guideline #14, Publication 95-0642US Dept. of Health and Human Services. In December of 1994 the Agency for Health Care Policy and Research decided to assess what was the most effective treatments for acute lower back pain. They discovered, by exhaustive overview of research studies, that spinal manipulation was the only recommendable physical treatment beyond short term rest and gradual return to activity. At our office we focus on safe, effective, and advanced manipulative methods and augment them with massage, craniosacral therapy and exercise, depending on need. When your back hurts it can come from one or several causes and it is important to find out specifically what the problem is so we know what we can do about it. Fortunately, most of these tests are straightforward, non-invasive, and not costly. Once we determine the cause or causes, we focus our attention on the various factors and treat accordingly. Every visit includes, as appropriate, an assessment of the nerve, disc, joint, ligament, and muscle structure and an efficacious treatment for the target area and its surrounding support structures. When you are feeling better, it is not because we have "treated the pain", it is because we have made you function better and stronger so the pain goes away. Read subchapters on anatomy of the low back, research and more by clicking on the subheadings of Lower Back Pain, on the left margin.